In-form Michael van Gerwen and two-time UK Open champion James Wade stormed into the last 16 with comfortable wins on Saturday afternoon, while Scottish pair Robert Thornton and John Henderson also reached the fifth round in Bolton. Wade swept past Dave Chisnall, winning 9-2 to keep alive his hopes of winning a third UK Open title. But the 2008 and 2011 winner, who has won five games to reach the last 16, insisted he is not thinking that far ahead. He said: “I’m looking forward to my next game, whoever it is against, and that is all I’m going to concentrate on at the moment. Wade will take on Henderson in the evening session for a place in Sunday’s quarter-finals after the Scotsman fought back from 8-6 down to defeat Kevin McDine in a deciding leg. “It’s a massive win for me,” said Henderson. 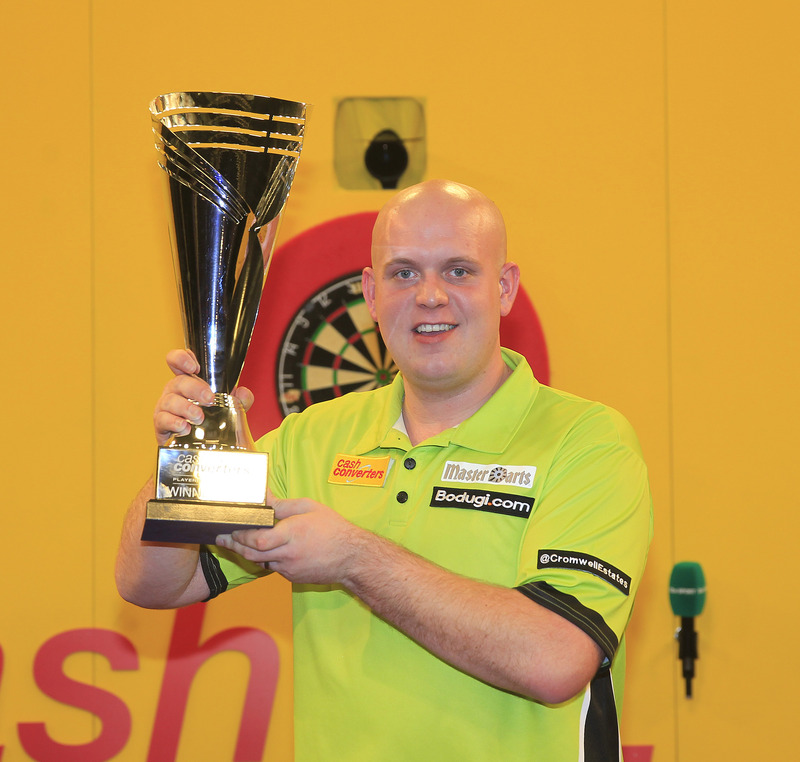 “It was very tense at the end and we both missed darts for the match but I was over moon when the last one went in. 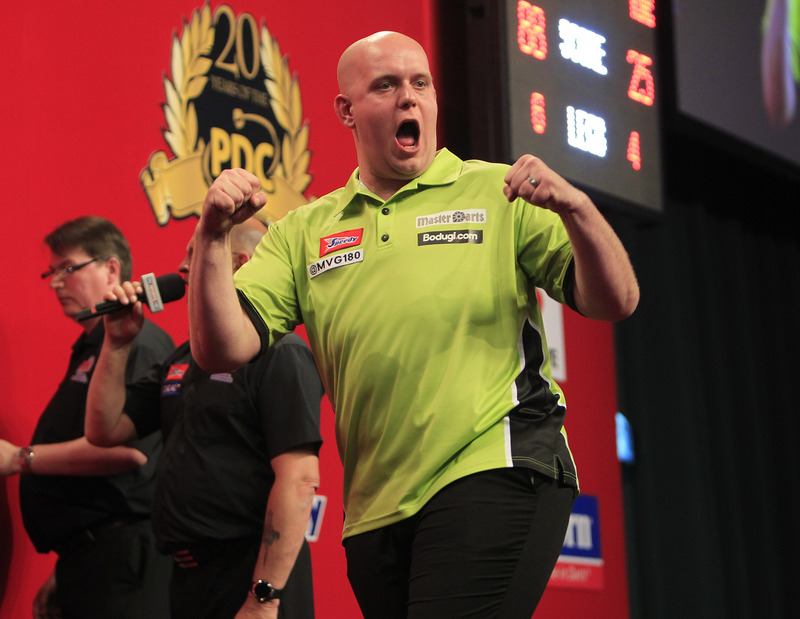 van Gerwen will face Terry Jenkins in round five after the Dutchman saw off Northern Ireland’s Michael Mansell 9-3. And the world number two is targeting an improved performance. “I’m not too happy with how I played in the first two games,” said van Gerwen, who had beaten Mervyn King on Friday. Defending champion Robert Thornton won the last four legs to claim a 9-5 win over Kirk Shepherd. The Premier League star, who will face Raymond van Barneveld on Saturday night admitted he had to work hard for the win. Thornton said: “Kirk is one of those players who will throw a brilliant leg and then a bad leg so when he puts a run together you can be in trouble. “I dug in and got the job done though. I played fairly well and I’m happy to be through. van Barneveld won his fourth round match comfortably, defeating Joey Palfreyman 9-3. Michael van Gerwen will face Phil Taylor in the final of the Ladbrokes World Championship on New Years Day, after the pair both won hard fought semi-finals on Sunday evening. Enjoying watching the darts on TV? – Head to our online shop to see if we have tickets on sale for an exclusive professional event near you. James Wade and Michael van Gerwen will go head to head in the semi-finals of the Ladbrokes World Championship after the pair both came out on top in thrilling battles on Saturday evening. World number three Wade produced a fine display of clinical finishing to see off Wez Newton 5-4, while van Gerwen defeated defending champion Adrian Lewis by the same scoreline in an all-time classic at London’s Alexandra Palace. Raymond van Barnveld will face Phil Taylor in the last four, after ‘Barney’ claimed an impressive victory against Simon Whitlock on Friday. The semi-finals take place on Sunday evening, with the victors contesting the final for the £200,000 first prize and new Sid Waddell trophy on New Years Day. Full match reports are available to read on each of the players’ official UK websites (see links below). 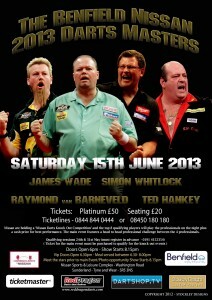 Tickets are now on sale for the 2013 Charlton Masters. Simon Whitlock came out on top in a thrilling last 16 match against Dave Chisnall, while James Wade, Michael van Gerwen and Raymond van Barneveld all won through to the quarter-finals of the Ladbrokes World Championship on Thursday. Whitlock defeated Chisnall in a dramatic tie break, with ‘The Wizard’ producing a spectacular 152 finish to save the match when it looked like his opponent was about to seal victory. The Australian will meet Raymond van Barneveld in the last eight on Friday evening after ‘Barney’ stormed past Gary Anderson 4 – 0. James Wade beat Vincent van der Voort by the same scoreline and will face Wez Newton on Saturday, when van Gerwen will take on reigning World Champion Adrian Lewis after defeating Colin Lloyd 4-1. 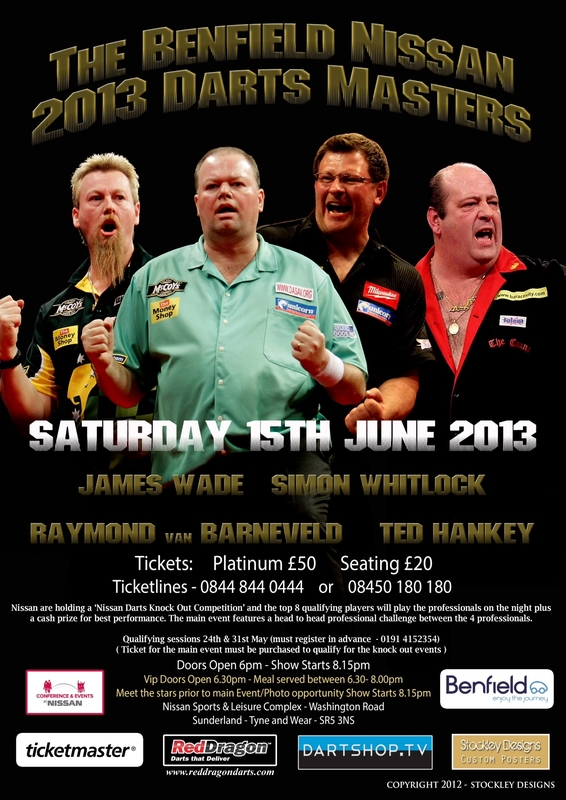 Get tickets for the 2013 Charlton Masters – On sale now. Michael van Gerwen, James Wade and Vincent van der Voort all won through to the last 16 of the Ladbrokes World Championship with victories on Sunday. van Gerwen stormed past Peter Wright, fighting back from two sets down to claim a 4-2 triumph at London’s Alexandra Palace. The Dutch ace averaged over 102 and hit twelve 180s in a brilliant performance that saw him win twelve out of the last 14 legs. ‘Mighty Mike’ will take on Colin Lloyd for a place in the quarter-finals when the action resumes after Christmas. Wade will meet van der Voort in round three after both players claimed 4-2 wins. ‘The Machine’ defeated Steve Beaton thanks to some clinical finishing, while ‘The Dutch Destroyer’ came out on top in a fantastic match against Dean Winstanley, who sensationally hit a nine-dart finish. Robert Thornton was denied a place in the quarter-finals by world number one Phil Taylor. The remaining third round ties will be played on Thursday 27 December, with Simon Whitlock and Raymond Barneveld also bidding for last eight spots. Simon Whitlock and Raymond van Barneveld both won through to the last 16 of the Ladbrokes World Championship with comfortable victories at London’s Alexandra Palace on Saturday. Whitlock whitewashed Colin Osborne, hitting a stunning 164 finish and averaging over 95 in the process, while van Barneveld defeated Brendan Dolan 4-1. The pair could meet in the quarter-finals of the £1 million pound tournament should they both win their third round games. 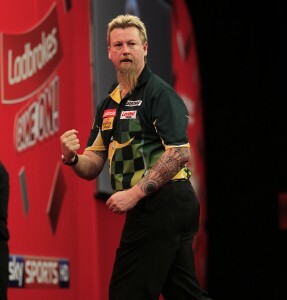 Whitlock faces Dave Chisnall on Thursday 27 December, when ‘Barney’ will take on Gary Anderson. Mark Webster was denied a place in the third round by Colin Lloyd. Sunday sees the completion of round two with James Wade facing Steve Beaton in the afternoon session and Vincent van der Voort up against Dean Winstanley, before Michael van Gerwen takes on Peter Wright in the evening. The third round also kicks off as Robert Thornton takes on Phil Taylor in the final match before the Christmas break. Robert Thornton and Paul Nicholson produced the most dramatic match of the 2013 Ladbrokes World Championship so far, with ‘The Thorn’ winning a sudden death decider on Friday evening. The pair put on a sensational spectacle for in front of the fans at London’s Alexandra Palace, sharing twenty 180s in an incredible second round encounter. Nicholson looked to have been closing in on victory after ‘The Thorn’ had missed six darts to win the match, when ‘The Asset’ broke the throw to take a 4-3 lead in the final set. But, with the Australian waiting on 56 for the match, Thornton hammered home a stunning 130 checkout and went on to progress to the last 16 after triumphing in the sudden death shoot-out.